I just got back from Rudy's Tacos in Culver city and I think I've found my new favorite taco truck. It's hard to see from the main blvd but if you're looking close enough you'll see the flood lights shining down on this taco truck at Venice and Melvil(one block east of Cataraggus). They come out nightly at 5:30pm and stay open til 1am. Weekends they stay open until 2am. I couldn't get a photo of the actual truck because of the amount of people hanging out in front of it but the actual truck wasn't much to look at anyways. It's what inside that counts and these guys really know how to prepare tacos. They specialize in tacos and in fact tacos is all they sell. 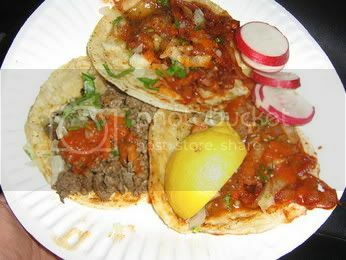 Tacos de lengua, asada, suadero, pastor, carnitas, cabeza, sesos. They do it all. I ordered asada and al pastor. 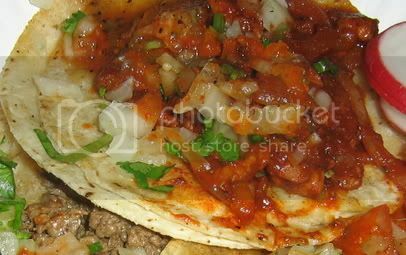 The asada was finely cut with a spicy salsa roja on top of warm fresh tortillas and the al pastor was juicy and covered with carmalized onions. The salsa roja and the sauce from the al pastor blended together to make an incredibly tasty sauce. There is something special about a truck that only sells tacos. 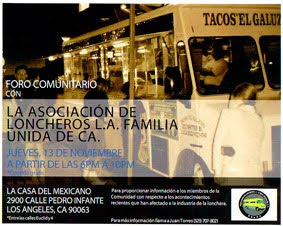 There's also something special about a taco truck that lets you eat your tacos before you pay. These guys are so confident in their product that they know after eating a couple of their tacos you will want more. Which I did. I've been waiting to "dos mas" since I started this taco hunt. I finished my last taco, nodded to the cook in approval and said "dos mas por favor" to which the cook replied "de que amigo?" Hey Bandini - Nice prices and great looking tacos! Thanks for the recommendation. I just went tonight, had 3 tacos, 2 pastor 1 asada. They were uniformly excellent. Your review mentions that they have carnitas tacos, but they in fact do not. The truck was doing a steady business just before 9pm on a saturday. Have you tried Mario's, a taco truck that's on Overland pretty much across from the Overland Cafe (halfway between Venice & Palms)p? It used to be in the car wash next to the McDonalds, and moved a block or two north. Thanks again, tomorrow I'll try Tacos Don Felix. I had a barbacoa burrito from Don Felix yesterday. Sabroso. thanks for the clarification on the carnitas. I went to Mario's back when they were at the car wash. I havn't been back since they moved up the street. They are on my list tho.I may give the cabeza a try there since I remember reading that is their specialty. Just had some and they were murder! You don't disappoint Bandini. Hey bandini, you're right, this is the guy. (in response to the taco truck ordinance posting). Best tacos by far in my opinion. I think I have atleast 7 tacos when i go there... the guy is really nice. Hey Bandini, just an update on this spot. Went there last night and freaked when i didn't see them at their spot. i ended up going East and making a U on La Cienega and going back west on Venice. I found them DIRECTLY across the street. I guess they go by Rudy's now... price is now $1.25 per taco, not $1.10 anymore. Thought you might wanna know. My favorite by far. I know part of the crew at this truck &they also make the best burritos!!!!! Hopefully those will come soon at their place when they move into the building. Can't waiiiiiitttttttttttt!!!!!!!!!!!!!!! I visit that place every week to try something different everytime. My favorite is the tacos de pollo asado but my husband loves the carne asada tacos. you guys have to try it. It doesn't hurt that everything is affordable because we all need it right now. I think their website is tacosdonjorge.com u guys can get the address there. Much love!! Rudys Tacos has been Tacos Don Jorge for some time now, I think its been going on two years now that I remember. I love that place, best al pastor.